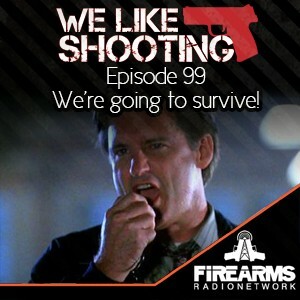 WLS 099 - We're going to survive! My name is Shawn and I’m addicted to shooting. Before we get started, Happy Independance Day! We have a guest trifecta tonight, please welcome Sean Maloney, Sven Jonssen and Brian Zawitowski! Ok, as our audience knows you all support We Like Shooting in a major way and we wanted to take this opportunity to say thank you! News story you might want to talk about? Owner of DEZ Tactical Arms, Inc.
No more waiting period on handgun purchases in the state of Wisconsin. Bill signed by Gov. Walker. Owner and head design guru at Manticore Arms, Inc. Gun shaped Iphone case - good idea or bad? Tonight we are going to do We Like Shooting Theater sponsored by Manticore Arms. Where we re-enact movie scenes, our style. Tonight we will perform a scene from “INDEPENDENCE DAY”. The President of the United States will be played by Lil. Bankrupt Colt has Indian Tribe on the way to a rescue. We regret to inform you of the passing of our favorite host, Lil Shantilly. Lil passed away from a sudden cardiac arrest, following the taping of an episode where both Jeremy and Aaron managed to not make an obscene comment or drop an "F-bomb".Oh, who are we kidding, she's alive and well. We know hell will freeze over before anybody on this show behaves.Great show with friendly banter between friends as they discuss current events and new products related to the shooting sport with a great selection of guests.